Mennonites use folk music in various ways. They borrow folk tunes for hymns, write religious music in the folk idiom, and use folk music as religious music, in addition to singing and playing secular folk music. In the 16th century, the poetic and musical styles of the Volkslied (folksong) were used for many martyr ballads in the Ausbund. In contrast to the art music of the established church, this music of the common people was accessible to all and thus symbolic of the Anabaptist emphasis on the priesthood of all believers. Patterns of borrowing folk materials in more recent Mennonite hymnals reflect differing perceptions of Mennonite ethnic identity. Folk tunes were used for hymns and gospel songs in the Gesangbuch der Mennoniten Brüdergemeinde (1955). This contrasts with their use for children's songs in the Gesangbuch der Mennoniten (1965), where the chorale is the standard fare. Seven folk hymns from the Harmonia sacra, representing the Swiss American Mennonite heritage, are found in the Mennonite hymnal (1969, GCM, MC). This differs from the Anglo-Saxon folk tunes, taken from the general cultural milieu, found in the Mennonite Brethren Worship hymnal (1971). The best researched aspect of the traditional American Mennonite folk music is that of the folk hymns found in the Harmonia sacra, the oldest shape-note book still in use. The book was first issued by Joseph Funk in Singer's Glen, VA, in 1832 as Genuine church music, and later became known as The new Harmonia sacra: a compilation of genuine church music. Published in its 22nd edition in Dayton, Ohio in 1959, the book is central to the annual Harmonia sacra hymn-sings still held in Virginia. Contemporary folk hymns were introduced to Canadian Mennonites by groups such as the "Faith and Life Singers" on radio station CFAM in Altona, MB. The continuing influence of the 1960's North American folk music movement is evident in the publication of hymnbook supplements in the contemporary idiom. Sing and rejoice! (1979) contains several international folk hymns, while Sing alleluia (1985) includes several sacred folk songs. The guitar and other folk instruments have become more acceptable in the church, especially in informal contexts. Mennonites such as Chuck Neufeld and Connie Isaac sing of their history and faith in folk and other contemporary idioms. Gordon Friesen, longtime editor of Broadside, a magazine of protest music, has also promoted the use of folk music to challenge traditional values and express compassion for the oppressed. In the past few decades a new Mennonite folk genre, the folk opera, has emerged. The Bridge (1975) by Esther Wiebe, and lyricist Di Brandt addresses such issues as intermarriage with non-Mennonites and contains traditional Russian Mennonite lullabies and "Schluesselbund Lieder" (singing circle games). Harold Moyer and James Juhnke's The blowing and the bending, also written in a folk idiom, voices reactions to participation in World War 1. Written and verbal references to singing secular folk songs often appear as criticisms of the one who sings Putzenlieder. Among Mennonites who have created sanctions against singing secular music, the contemporary religious music of the day has served that function. Where the chorale was used in church, the gospel song served as entertainment for the young people. Singings and barn dances among the Amish and folk and square dancing among Old Colony Mennonites, however, have provided a musical and social outlet for young people. While Mennonites have traditionally borrowed secular folk music, even this process reflects Mennonite beliefs. The absence of Marienlieder (songs to the virgin Mary) and Heldenlieder (war hero songs) among 18th-century Prussian Mennonites, but the increasing presence of Soldatenlieder (soldier songs) during the time of the early 20th-century Selbstschutz (see Heinrich Friesen collection), demonstrate changing Mennonite values. Similarly, the singing of High German nature and homeland (Heimatlieder) songs by Mennonites in 19th- and early 20th-century Russia, showed their essentially German orientation. As in Russia, Canadian Mennonites have been introduced to folk singing in the home, in the school, and through such community choirs as the internationally acclaimed Mennonite Children's Choir Winnipeg. 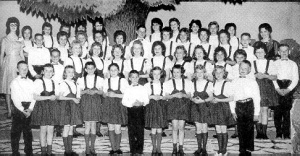 In the wake of renewed Canadian ethnic consciousness, several Low German singing groups have been formed in southern Manitoba. "De Heischraitje en de Willa Honig" ("Locusts and Wild Honey," 1975) critique the foibles of Mennonite village life through songs accompanied by a jug band. "De Jereeschte Tweeback" ("Roasted Buns," 1981) have popularized the traditional Low German songs of Manitoba's Russian Mennonites found in Doreen Klassen's Singing Mennonite collection. Eskey, Harry. "Shape-note Hymnody in the Shenandoah Valley of Virginia, 1816-1860." Diss. Tulane U., 1966. Frey, J. William. "Amish Hymns as Folk Music," in Pennsylvania Songs and Legends, ed. George Korson. Philadelphia: U. of Pennsylvania Press, 1949. Friesen, Heinrich. Untitled collection of folksongs, (located in Mennonite Church Canada archives, Mennonite Heritage Centre, Winnipeg, microfilm 69, n.d.
Klassen, Doreen. Singing Mennonite: Low German Songs Among the Mennonites. Winnipeg: University of Manitoba Press, 1988. Martens, Helen. "Hutterite Songs: the Origins and Aural Transmission of Their Melodies From the Sixteenth Century. Ph.D. diss., Columbia U., 1968. Martens, Helen. "The Music of Some Religious Minorities in Canada." Ethnomusicology 16, no. 3 (1972): 360-71. Peacock, Kenneth. Twenty Ethnic Songs from Western Canada. Ottawa: National Museum of Canada 1966. Teichroew, Allan. "Gordon Friesen, Writer, Radical and Ex-Mennonite." Mennonite Life 38 (June 1983): 4-17. Conrad Grebel College Chapel Choir singing "Gott ist die Liebe" from How can I keep from singing (CGR-974CD, 1997; 1.5 minutes). Used by permission. Chuck Neufeld singing "Part of Me Wishes" from Part of Me Wishes, Part of Me Knows (MVS CD 1993; 3.5 minutes) Used by permission. Faith and Life Male Choir singing "Reve ta Stoh'ne" from Memories (Ukraine Tour, 1992; 2.5 minutes) Used by permission. Klassen, Doreen. "Folk Music." Global Anabaptist Mennonite Encyclopedia Online. 1989. Web. 21 Apr 2019. http://gameo.org/index.php?title=Folk_Music&oldid=102216. Klassen, Doreen. (1989). Folk Music. Global Anabaptist Mennonite Encyclopedia Online. Retrieved 21 April 2019, from http://gameo.org/index.php?title=Folk_Music&oldid=102216. Adapted by permission of Herald Press, Harrisonburg, Virginia, from Mennonite Encyclopedia, Vol. 5, pp. 305-306. All rights reserved. This page was last modified on 5 October 2013, at 20:58.